I should have this weeks drawing stuff finished up by tomorrow. Thanks for your patients. Rusty and Tammy, your stuff is going out on Wed. Had to track down misplaced notebooks. This weeks drawing will be for one pack of the Rainbow Pencils. I am told they are slowly starting to ship. With that I will ship the winners out the same time I receive mine. This weeks winner will also get some extra goodies. Only 20 entrants so far (light). Remember you CAN win more than once. I keep EVERYONE in the pool. Two more weeks to go..
Next week will be one of the NOCK cases. Please check out the link for all of the cases they are making. And finally for the end of the year. A truly excellent combination of old world expertise, this gift set is a timeless piece for any writing enthusiast. 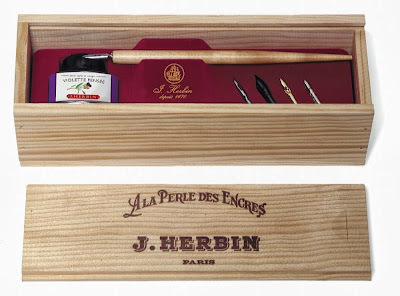 It is presented in a lovely wood box and contains 1 nib holder, 5 different stainless steel nibs and 1 bottle of ink. For the traditionalist, the Brause (Made in Germany) Stainless steel nibs are among the world's finest for a dip-pen writing experience. This set has 5 different types - Iserlohn 50, Brause Cito-Fein Iserlohn, Brause No. 361 Iserlohn, Brause No. 85 Iserlohn, Brause No. 65 Iserlohn. They are complemented by 30ml of Violet J Herbin Ink (Made in France) and a nib holder. You have 2 weeks to get your entries in. REMEMBER TO FOLLOW THE RULES (link to rules I promise they are in there. Two entries received were disqualified). Thanks for playing and reading. 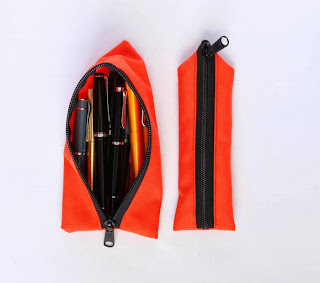 Karas Kustoms and a new Kickstarter.. It's time to order your Santa Letters..
Week 1 (of 5) Giveaway winner.